It spoke to you, right? I mean it looks like Babe. That'll do pig. And here I was wondering where Charlotte might be hiding... Beautiful pig. Look Out! It's a future Hogzilla! What a charming little guy! I can see how you would want to smuggle him home. As a child I raised a little cutie (named Snoopy) like him by bottle. Hmmmm....makes me nostagic & miss the farm. I really appreciate your blog. Beautiful pics! 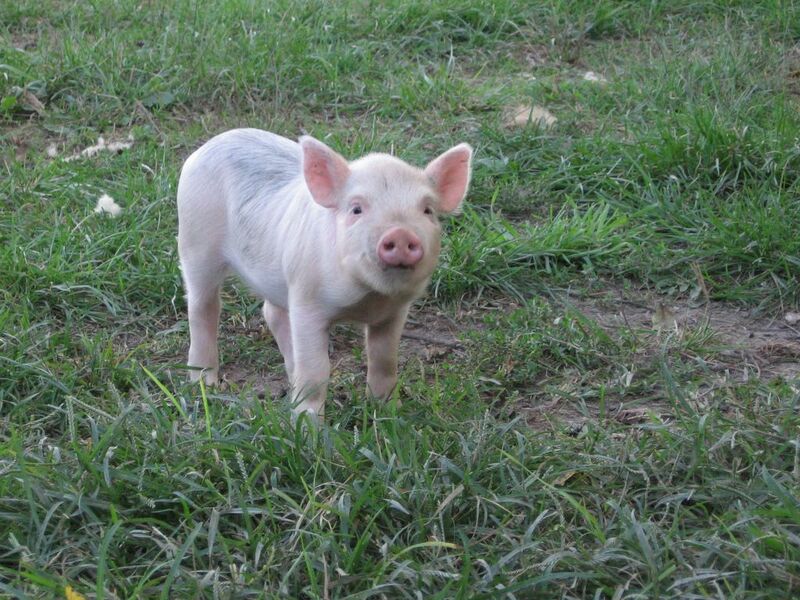 Oh c'mon...you should bring home just one piglet, a lifelong friend for Cary! i'm with skilz, it's unreal that something so cute can turn into such a monster!! What an adorable little urchin. Can you imagine what life would be like with him underfoot??? I would have been tempted, too, but since you have Cary, you're all set! So cute I just to squeeze it. Ohh I would have had to have that little guy! He could have helped out showing you where there were weak places in your fencing! now he could have been another terror in the garden for you! and they root up EVERYTHING IN SITE! Never thought I would ever smile seeing a pig...on a pc screen! You did it again. Hi there, I just discovered your site and have marked it as a favorite. Your photos are fantastic and your photo of 7/8/06 of the blue butterfly on a cone flower (Echinachea) was stunning!! Oh, my favorite! I raised pigs as a kid and even bottle fed a few. So cute!! I love visiting your site. You have such wonderful pictures! Problem is, my husband will want to turn him into bacon. I knew it. You have superhuman powers. There is no way I'd get away without taking that pig with me. He's scary cute. if you remember that i mentioned a super heavy duty UV resistant tarp a few months ago. well, i have an extra one it is 20' by 24' if you want it $20 email me. Charlotte's Web was one of my favorite books growing up. However, I'm also severely arachnaphobic. Go figure!